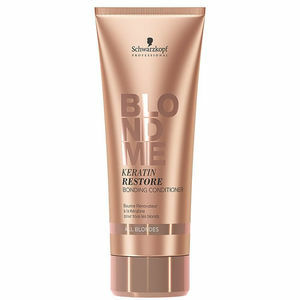 Deeply nourishes and conditions bleached or dyed blonde hair while restoring elasticity. Schwarzkopf Professional BLONDME Keratin Restore Bonding Conditioner ALL BLONDES is specifically developed to deeply condition and protect bleached or dyed blond hair. Using KeraLamination Technology to restore hair's lost keratin, this brilliant nourishing conditioner repairs hair from the inside out, bringing the elasticity back. It restores hair health, repairing chemical as well as everyday damage. Hair is left feeling wonderfully soft, with a super glossy shine, having been deeply conditioned. Simply apply the conditioner to clean, damp hair, then gently massage from the middle to the ends of the hair. Leave on for a few minutes and then rinse thoroughly.